Selling your home doesn’t have to be a hassle. That’s why, as your Chicago realtors, we work to successfully market your home to sell quickly and profitably. We provide an accurate property value range, create an effective marketing plan and wisely negotiate with home buyers to make the entire home selling experience simple and stress-free. According to Crain's Chicago Business and Midwest Real Estate Data - in 2016, condos and townhouses in Logan Square and West Town (which includes Wicker Park, Ukrainian Village, East Village, Noble Square, Pulaski Park and River West) are selling faster than any other homes in Chicago at an average of 57 days vs a city average of 89 days. What does that mean for you? The time to sell your home in West Town and the Near Northwest Side of Chicago is now! With home buyer inventory at historic lows in Chicago, we will work to leverage the current real estate market conditions and make sure you receive the most money for your home, in the least amount of time possible. As your Chicago realtors, we are by your side from start to finish. From prospecting for potential home buyers, to hosting open houses – we provide expert, knowledgeable customer service every step of the way. Using the Keller Williams skilled creative team, we will produce professionally designed, personalized real estate marketing materials to market your home, from beautiful home photography, to a multi-color brochure, and a customized online virtual tour of your home. By listing your home for sale with our team, your home will receive unmatched online exposure to thousands of home buyers that are looking for a home like yours. * Please fill out our new seller questionnaire form. As soon as we receive your completed form, we will get in touch to help you sell your home quickly and profitably! "So far this year, condos and townhouses in Logan Square and West Town are selling faster than any other homes in Chicago at an average of 57 days vs a city average of 89 days." Step 1: Hire the Right Realtor - choose a Chicago realtor that knows the local neighborhood market. Your Chicago realtor's main responsibilities will be to provide an effective real estate sales and pricing strategy, create an effective real estate marketing plan, actively prospect for home buyers that are looking for a home like yours, negotiate the highest price for you home possible and guide you through the sale of your home to the closing table. Step 2: Deep Clean and Declutter Your Home - your product is your home, and when your home is listed for sale on the real estate market, it needs to look its best in order to attract the most home buyers possible and multiple offers from home buyers. When you receive multiple offers for your home, your chances of getting the highest price for your home are dramatically increased. Step 3: Hire a Home Inspector for a Pre-Market Inspection - the home buyer that decides to buy your home will hire a home inspector after their offer for your home is accepted. The home inspector will be given approximately 2 hours to come into your home and perform a "check-up" so the home buyer knows exactly what they are buying and what issues the home may have that need to be addressed. It is always a good idea to hire a home inspector yourself for a pre-market inspection so any major issues with your home can be addressed before your home is listed for sale. Step 4: Professional Photography, Video and Brochures of Your Home - as your Chicago real estate agents, we will create an effective real estate marketing plan that will get your home sold for the most amount of money, in the least amount of time. We have relationships with the best home photographers and graphic designers in Chicago that will create beautiful marketing materials that we will use to effectively market your home to thousands of Chicago home buyers. Advertise your home for sale on the Top Agent Network (TAN), a private online community where the verified top 10% of real estate agents in Chicago collaborate & exchange valuable non-MLS information for the benefit of their clients. Conduct a broker open house - this is an open house for licensed Chicago real estate agents only. Once the Chicago real estate agents attend the broker open house, they will tell their home buyer clients about your upcoming home listing before your home hits the public market. Create a Private Active Listing on the MLS - the MLS allows Chicago Realtor's to create a private active listing on the MLS to pre-market your home listing to thousands of Chicago real estate agents before your home hits the public market. Step 6: Enter Your Home into the MLS Database - once the photos of your home are ready, we will enter your home into the MLS database and your home will officially be publicly listed for sale. By this time, we will have already determined when your first open house will be and we will conduct all of the first showings of your home at the first open house. This will help to increase our chances of getting an offer from a home buyer the first weekend your home is listed for sale. We will also run a reverse prospecting search in the MLS to make sure we contact the real estate agents who represent home buyers that have an MLS search that meets your home's criteria. 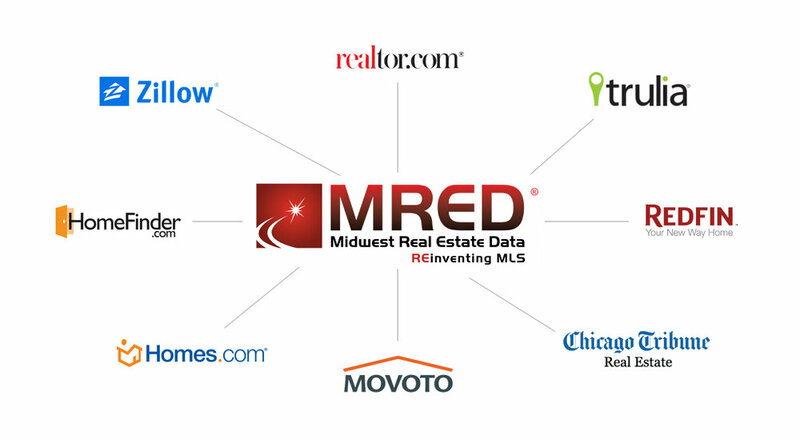 Once your home is entered into the MLS, your home listing will automatically populate all of the other real estate websites on the internet including Zillow, Trulia, Redfin and Realtor.com exposing your home to hundreds of thousands of Chicago home buyers. This is how to get your home listed on Zillow, Trulia, Redfin and Realtor.com. Step 7: Social Media Marketing - once your home is officially listed for sale, we will promote your home listing across all of our social media channels including Facebook, Twitter, Google+ and Instagram. Step 8: The First Week Your Home is Listed for Sale - during the first week your home is listed for sale, we should expect 5 - 15 showing requests in addition to the home buyers we get at your first open house. If we do not meet our goal of 5 - 15 showing requests, we need to analyze the reason for this and rethink our sales and marketing strategy. A few reasons a home may not be getting the home buyer showing requests we are aiming for are: home does not show well in the photographs of your home or the home is not priced correctly. At this point we need to have an honest conversation about what needs to be changed to get more home buyers in your door. Purchase Price - how much money is the home buyer offering for your home? Earnest Money - how much earnest money is the home buyer offering to put down on the home? Closing Cost Credits - is the home buyer asking for a closing cost credit? Closing Date - does this date align with your preferred timeline to sell your home? is the home buyer paying cash or is the home buyer taking out a mortgage? if the home buyer is taking out a mortgage, how much money is the home buyer putting down? what is the home buyer's interest rate cap? "As Is" - is the home buyer offering to take your home "as is"? Home Sale Contingency - does the home buyer have a home sale contingency? After we accept an offer from a home buyer, the home buyer will schedule a home inspection. The home inspector will be inside of your home for approximately 2 hours. After the home inspection is complete, the home buyer will receive an inspection report. Based on the contents of the home inspection report, we will most likely receive a request from the home buyer's real estate attorney to do one or a combination of the following: fix or replace some or all of the items in the home inspection report, provide a monetary credit for the home buyer to fix some or all of the items in the home inspection report or a combination of the two. During the attorney review period, another round of negotiations takes place based on the home inspection items and any other terms set forth in the offer contract from the home buyer. Having an experienced real estate attorney will be key at this stage. We work with some of the best real estate attorneys in Chicago and we are happy to provide a referral for a real estate attorney if you need one. Step 10: Closing - after the attorney review period is complete, we wait to go to the closing table. During this time you are finalizing all of the details for your move and making sure you completely vacate the premises before the closing date. It is not required that a home seller attend closing because your real estate attorney will prepare all of the closing documents prior to closing and make sure you have signed all of the appropriate closing documents prior to the closing date and that title for your home is transferred to the home buyer. After closing is complete, your real estate attorney will email us a copy of the settlement state / HUD statement. If you still owe money on the home you are selling, your real estate attorney will make sure that your loan balance is paid off and the balance will be paid to you via check or wired funds depending on your preference. Congratulations, the sale of your home is complete! Questions on Selling Your Home? Contact Us!